Chakras are extensions of our consciousness. Spiritual, emotional, mental and physical energy are drawn through your chakras, which interact with your body to keep you healthy. If the chakras are blocked by emotional or physical distress; this causes them to spin at a different speed then normal. I can sense disturbances in you chakras’ energy fields, able to realign the energy flow. Crystals can also be used to help improve the energy flow. The Chakras are all interconnected, and thus a blockage in one area can produce a variety of effects. I can remove negative energy and bring positive well being back into your life and help you reconnect with your self and see that there is light at the end of the tunnel. 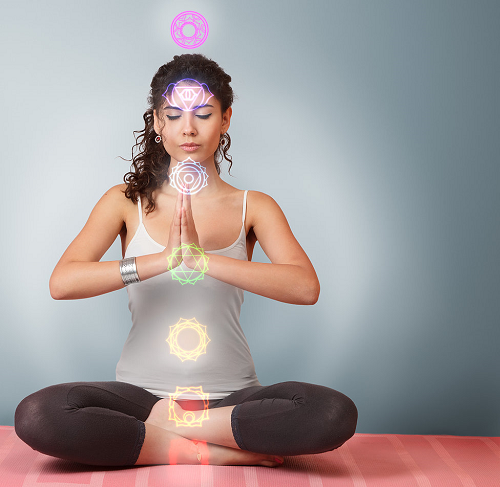 Experience the Incredible Feeling of Well Being, When Your Chakra Energy Becomes Totally Balanced! Our Chicago Chakra Tools are custom designed by Faith to balance and help your energy flow more naturally. Take a look at our Teas, Candles, Oils and other items by visiting our store. 1st Chakra: Base or Root ChakraKundalini: Root Chakra: Located at the base of the spine. Earth, survival, grounding, stillness. Contains the primary 8 cells that have all of the knowledge of creation and remain the only cells in your body that do not change in your lifetime. It grounds us in the physical world. 2nd Chakra: SpleenLocated just beneath the navel, and related to our sexual and reproductive capacity. Blockage manifests as emotional problems or sexual guilt. 3rd Chakra: Solar PlexisSeat of Emotions. Gives us a sense of personal power in the world. Blockage manifests as anger or a sense of victimization. 4th Chakra: Heart ChakraBlockage can manifest as immune system or heart problems, or a lack of compassion. 5th Chakra: ThroatTied to creativity and communication. Feels pressure when you are not communicating your emotions properly. 6th Chakra: Third Eye Pineal GlandOften connected to the forehead. Is a physical eye at the base of the brain with the capabilities of looking upward. Clairvoyance, psychic abilities, imagination, dreaming. 7th Chakra: CrownConnects you with message from higher realms. Can be experienced as a pressure on the top of the head. Spiritual connection, understanding, knowing, bliss, God.